That’s always sad when a book that sounded exciting turns out to be not what you expected. Thank you for your honest review, Vicki. I don’t like leaving such negative reviews, but I have to be honest. My mind would wander with a narrator like that. Many reviewers didn’t even mention his voice, but I’ve always been picky. I just don’t enjoy a dull monotone. I’m sorry this didn’t work for you, but I do appreciate the honest review. I was sad the book didn’t take me on the trip I was expecting. I too was so, so looking forward to this. I know what you mean about the book just didn’t give me enough. I did a combo listen and read and I liked the narrator’s voice. BUT I listened only when doing the dishes or walking and then switched back to print. Humm, I guess that tells you something there. I reviewed the book today. I’m going now to check out your review. I think I’d be looking for the same true life adventure story that you were looking for so I don’t think I would be quite satisfied with it either. I like the idea of this one but I think I’ll pass on it. I’m in the minority Katherine, most reviewers loved this book! Sometimes there’s a book about a real life story that sounds really exciting, but then it turns out most of the book is about peripheral details. It’s hard to have your expectations thwarted! Yes, I was expecting so much more of his trip. I’m sorry you are dissapointed. I guess I was too hyped about it. From the title, I’d certainly expect what you did. Yes, and although it was a good book, it wasn’t what I was looking forward to. Sorry to hear this wasn’t more exciting! 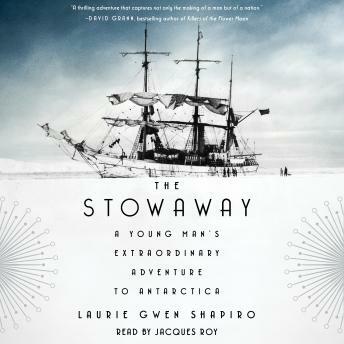 I really enjoy nonfiction adventure stories, so this is definitely a book I’m interested in. I love nonfiction too, especially adventures. This just had more facts than adventure. I’ve been looking forward to this one for awhile, so it’s a little disappointing that the actual stowaway’s story is such a small part of the book. Maybe it was a good idea that didn’t have enough juice for a full story. I don’t know what the deal with it was, but it sure wasn’t what I was wanting. Still, the book was worth the time and did give a lot of info I was unaware of. Ugh audiobooks can be really hit and miss. I’m sorry the narrator sucked – a bad narrator can really ruin a book. But this sounds interesting – I’ll skip the audiobook and grab a printed copy! I hope you enjoy it more than I did. I am in the minority with my thoughts.